Culling is not the answer to solve the tuberculosis issue in cattle because there is overwhelming scientific evidence that it will not reduce disease prevalence; in many instances culling will exacerbate the problem. The authors of the Randomised Badger Culling Trial (RBCT), the largest experiment on bovine TB ever undertaken in the world, concluded that culling could make no meaningful contribution to the control of TB in cattle in Britain because of the well-documented ‘perturbation’ effects of disease spread when badger populations are disturbed, and also because of the costs of killing. In an attempt to lower the costs of culling, the government has suggested several variations from the RBCT methodology: a longer culling period, shooting of free-running badgers rather than cage trapping and relying on the commitment of the farming industry rather than professionally trained and employed operatives. In my opinion, each of these deviations from the RBCT methodology is likely to further increase the perturbation effect and to reduce any net potential benefits of culling. As a veterinary surgeon, animal welfare is my primary concern and constant endeavour. Shooting of free-running badgers has never been carried out before and is likely to be extremely difficult for the marksmen involved, resulting in injured live badgers. From our own records at Secret World Wildlife Rescue, we know that dependant badger cubs will die underground at either end of the proposed culling season. I am not reassured by the measures that have been put in place by DEFRA to monitor badger welfare during the proposed pilot culls. It is often stated, both by the press and politicians, that the veterinary profession unequivocally supports badger culling. This view has arisen because the British Veterinary Association (BVA), the profession’s representative body, has been greatly influenced by the British Cattle Veterinary Association (BCVA) membership and adopted an aggressive pro-culling attitude. Like many others in allied professions and support services, these veterinary organizations have found it difficult to realign their traditional position despite the strong evidence against badger culling. Other veterinary bodies, such as the British Veterinary Zoological Society (BVZS), which includes many veterinary wildlife specialists, are against badger culling as part of TB control methods in cattle, and their views increasingly reflect the majority of veterinary surgeons. What are the alternatives to badger culling? It is difficult to diagnose, protect against, and treat TB. No simple single policy, including culling badgers, is the answer and any such suggestion does no favours to farmers struggling with the disease in their cattle. Politicians like simple answers and find it hard to accept that solutions are complex, and potentially expensive. There is no easy answer to the TB problem, but we do have several other measures at our disposal to control recognized risk factors. We must control cattle movements as most outbreaks of cattle tuberculosis arise from introduction of infected cattle to previously clean herds; this was especially evident is association with restocking following Foot and Mouth Disease in 2001. TB risk can also be reduced by improving farm biosecurity – avoiding badger-cattle transmission – and biocontainment – avoiding cattle-cattle transmission. There is much recently-published evidence that simple biosecurity measures are extremely effective in preventing badger-cattle contact around farmyards, yet few farmers employ such methods. The licenced badger BCG vaccine should be used immediately. The vaccine is effective in reducing the incidence of TB in both individual animals and on a population basis, for example by protecting new-born cubs. Such protection of badgers is likely to have a positive impact upon the disease incidence in cattle. The current vaccination method by injection is not ideal, as individual badgers must be caught and vaccinated, and there is urgent need for research on the production of an oral baited vaccine. Liz Mullineaux has worked predominantly in private veterinary practice for 25 years. For the first 15 years of her career she worked in ‘mixed’ practice, a combination of small animal, horse and farm work. Her veterinary farm experience included small-holdings to large commercial units, working with dairy and beef cattle, pigs and sheep in Norfolk and Somerset. She lives in rural Scotland, has many friends who are farmers, and a partner, who is a veterinary specialist in cattle medicine. Liz has always been interested in wildlife and the environment and, in 1995, became responsible for the veterinary work for Secret World Wildlife Rescue, a large wildlife charity, which specializes in the care of badgers. In 2011, she was awarded a doctorate by the University of Edinburgh, which looked at ‘Factors affecting the rehabilitation and release of adult badger casualties.’ A large part of her thesis involved the diagnosis of tuberculosis. 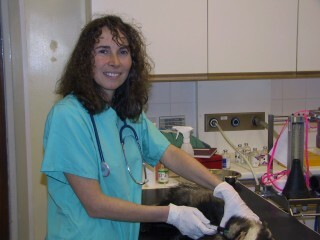 She currently works as the scientific advisor to a wildlife centre specializing in badgers.